When/Where Do I Test? | ARCCC, Inc. The Amateur Radio Club of Columbia County, Inc. sponsors VE Testing on the second Saturday of Odd Months. The testing sessions begin at 9 AM local time and are held at the Columbia County Emergency Operations Center located at 650-B Ronald Reagan Drive, Evans, GA 30809. 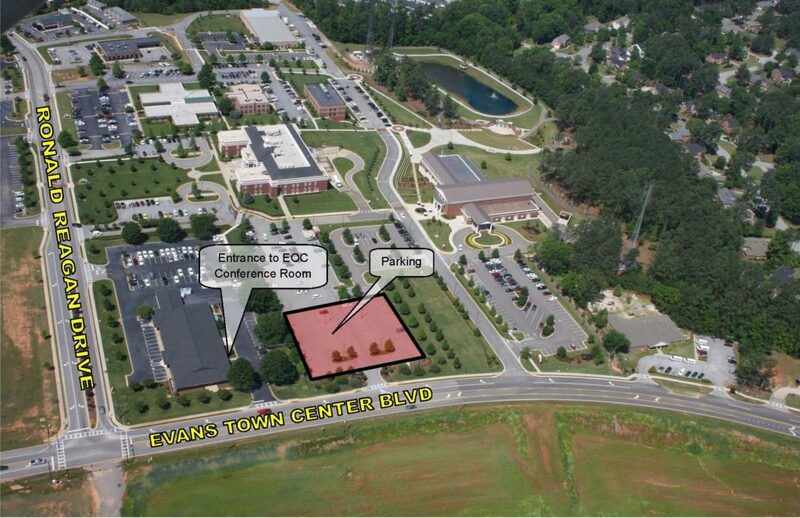 Parking is in the rear of the EOC in the Justice Center Parking Lot highlighted in pink in the photo below. Enter through the EOC Conference Room Door. 1. All applicants should bring a pencil, pen or both. 2. All applicants must present a government issued photo identification. If an applicant is already licensed, he/she must bring a copy of his/her current license to be included in paperwork sent to ARRL/VEC. 3. The fee for testing is $15.00 cash or check made out to ARCCC, Inc.
5. Copy of current license or a printed out “Official Copy” (not a Reference Copy) of your license to submit with your test if you are upgrading. You may log into the FCC ULS here to print out an Official Copy of your license to submit with your test. Reference Copies are not accepted. 6. Applicants should arrive at the testing location approximately 10 minutes early. An applicant may use a simple calculator (one that cannot store data (ie. formulas). Scratch paper is provided. Please use the form below to notify the examination team of your plans to attend the upcoming examination. I plan to attend the upcoming VE Test session.